Discussion in 'Plumbing Forum, Professional & DIY Advice' started by clax66, Apr 17, 2019 at 8:24 AM. I have a 4" PVC floor drain. for reason I won't get into I want to convert it to a clean out. The PVC pipe is flush with the poured concrete floor. What product would be best to accomplish this? It would be nice if it had a nice brass or stainless steel cover. Its not really the answer to your question, but when I installed a basement floor drain I used this one by Sioux Chief https://www.siouxchief.com/products/drainage/residential/floor-drains/weldone. It is floor drain with a plug you can remove to use it as a cleanout. It also has a knockout for a trap primer. the Cast Iron Clean out is the right idea but a little too rough looking.
. for reason I won't get into I want to convert it to a clean out. If that reason is a concern for backups, you might be able to put a test plug into the bottom of the drain bowl. is this test plug permanent? Permanent in that it will hold until I decide to take it out. There is a 'possibility' of backups and I don't want to take any chances. I think they are long-lived. You need to get the size right. There are ones sized by nominal size, and some sized differently. Thanks Sylvan. That looks good but my floor is finished. That product looks like it needs to be installed prior to the floor being poured. I am just a DIYer so maybe I am not understanding the product. I was hoping there would be something like a toilet flange that glued inside the 4" PVC drain. Maybe a little chipping of concrete to allow the cover to be flush with the floor surface. What do you think about this one? It looks like I will need to cut the pipe down a few inched below the surface. Its hard to tell from the description. 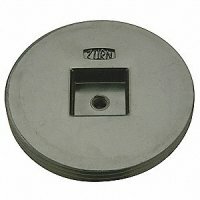 Your floor drain should have a trap under it so it would be completely useless as a functioning cleanout, unless the trap is removed and replaced with an elbow. Plumber friend told me the drain would work since it was 4" PVC. Likely not perfect but would work. The main thing is that it gets covered with a good seal. Some floor drains have a cleanout plug in the bowl, that bypasses the trap. Some, but not all, in fact, very few, and I would never even consider trying to "snake" a drain through a "P" trap. I doubt that your "plumber friend" has ever unplugged a drain line.